Old Bollywood poster for sale of the blockbuster Hindi film, Padosan (1968). This is an actual surviving original vintage Bollywood poster of the 1968 Hindi comedy starring Sunil Dutt and Saira Banu in lead roles. Kishore Kumar and Mehmood played memorable supporting roles in the film. Padosan finds mention among must see Bollywood film rankings across the world, making this poster, highly collectible! Printed and circulated a few years after the first release of the film (early 1970s), this old hand painted Bollywood movie poster was originally designed for publicity of the film but never ended up being used. This old Indian poster features stunning hand painted artwork. Originally designed on canvas by an art studio in Mumbai (Bombay), the poster is based on the two classic unforgettable songs from the film, “Mere Samne Wali Khidki Mein” and “Ek Chatur Naar.” A quirky portrait of Saira Banu is seen on the top. Smaller hand painted portraits of Sunil Dutt, Mehmood & Kishore Kumar are seen on the bottom of this hand painted Bollywood poster. 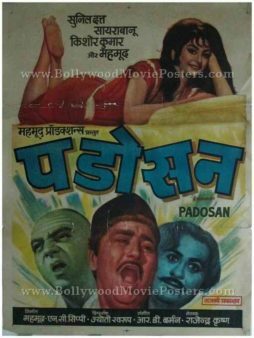 Old Bollywood poster of the blockbuster Hindi film, Padosan (1968) for sale. Printed and circulated several years after the first release run of the film (late 1970s), this old hand drawn Bollywood movie poster was originally designed for publicity of the film but never ended up being used. This vintage Bollywood poster features quirky hand drawn artwork. Originally designed on canvas by a small time art studio in Delhi, the poster has a very quirky appearance. The artwork of this old Hindi movie poster designed and printed in Delhi is based on the two classic unforgettable songs from the film, “Mere Samne Wali Khidki Mein” and “Ek Chatur Naar.” A quirky portrait of Saira Banu is seen on the top. Smaller hand painted portraits of Sunil Dutt, Mehmood, Kishore Kumar & Om Prakash are seen on the bottom of this old Bollywood movie poster. Old Bollywood movie poster of the blockbuster hit Hindi film, Padosan (1968) for sale. This is an actual surviving original vintage Bollywood movie poster of the 1968 Bollywood comedy starring Sunil Dutt and Saira Banu in lead roles. Kishore Kumar and Mehmood played memorable supporting roles in the film. Printed and circulated a few years after the first release run of the film (1970s), this old hand painted Bollywood movie poster was originally designed for publicity of the film but never ended up being used. This vintage Bollywood movie poster features stunning hand painted artwork. Originally designed on canvas by a small time art studio in Delhi, the poster has a very vintage and quirky appearance. The artwork of the poster seems to be inspired from the two classic unforgettable songs in the film, “Mere Samne Wali Khidki Mein” and “Ek Chatur Naar.” A stunning portrait of Saira Banu is seen on the top. 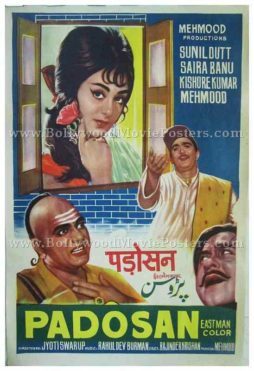 Smaller hand painted portraits of Sunil Dutt, Mehmood and Kishore Kumar are seen on the bottom of this Padosan poster.